There are 19 sports clubs (official clubs) which belong to club federations and two sports groups at our university (as of June 1, 2018). Japanese archery, volleyball, aikido, kendo, tennis, soccer, baseball, table tennis, Basketball, dance, badminton, handball, lacross, athletics, and so on. There are 16 cultural clubs (official clubs) which belong to club federations and five cultural groups at our university (as of June 1, 2018). 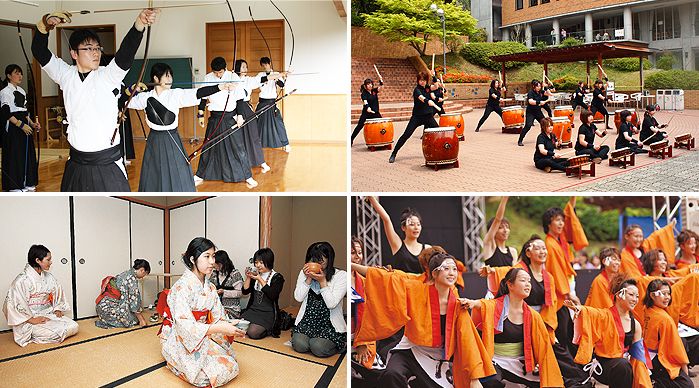 wind band, tea ceremony, drama, music, kimono, photography, calligraphy, traditional Japanese music, art, Japanese drums, manga, history, bakery, movies, astronomy, fashion, broadcasting, cuisine, and so on. There are eight volunteer groups which belong to committees for the promotion of volunteering at our university (as of June 1, 2018). campus life support, emergency medicine, sign language, child safety, and so on. Copyright(c), Kyoto Tachibana University. All Right Reserved.